Hieromartyr Januarius, Bishop of Benevento, and the deacons Proculus, Sossius and Faustus, Desiderius the Reader, Eutychius and Acution suffered martyrdom for Christ about the year 305 during the persecution ordered by the emperor Diocletian (284-305). They arrested St Januarius and led him to trial before Menignus, the governor of Campagna (central Italy). Because of his firm confession of Christianity, they threw the saint into a red-hot furnace. But like the Babylonian youths, he came out unharmed. Then at Menignus’s command, they stretched him out on a bench and beat him with iron rods until his bones were exposed. In the crowd were Deacon Faustus and the Reader Desiderius, who wept at the sight of their bishop’s suffering. The pagans surmised that they were Christians, and threw them into prison with the hieromartyr Januarius, in the city of Puteolum. At this prison were two deacons who had been jailed for confessing Christ: Sts Sossius and Proculus, and also two laymen, Sts Eutychius and Acution. On the following morning they led out all the martyrs into the circus to be torn to pieces by wild beasts, but the beasts would not touch them. Menignus claimed that all the miracles were due to sorcery on the part of the Christians, and immediately he became blinded and cried out for help. 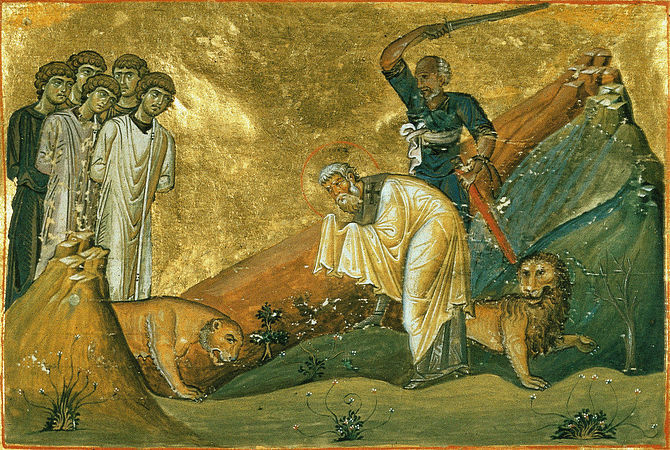 The gentle hieromartyr Januarius prayed for his healing, and Menignus recovered his sight. The torturer’s blindness of soul, however, was not healed. He accused the Christians of sorcery, and ordered the martyrs beheaded before the walls of the city (+ 305). Christians from surrounding cities took up the bodies of the holy martyrs for burial, and those of each city took one, in order to have an intercessor before God. The inhabitants of Neapolis (Naples) took the body of the hieromartyr Januarius. With the body, they also collected his dried blood. Since the fifteenth century, the blood liquifies when the container is placed near another relic, believed to be the martyr’s head. Many miracles proceeded from the relics of the hieromartyr Januarius. During an eruption of Vesuvius around 431, the inhabitants of the city prayed to St Januarius to help them. The lava stopped, and did not reach the city. Consecrated through anointing with oil, / You became pastors for your godly wise people. / You were slain as honorable lambs / And offered to the Word and First Shepherd, / Who was Himself slain as His sheep, / O most laudable Hieromartyrs Januarius and Theodore, / Beacons for all the world. / Therefore we all honor your holy memory in love, / As you intercede for our souls. Naples has found you a champion in dangers, / O Januarius, our glorious father. / You delivered her from plague, famine and affliction, / And from the fire of Vesuvius. / With faith and love we venerate you and honor your holy relics! You were adorned with the anointing of the priesthood / And the blood of martyrdom, O glorious Januarius and Theodore, / And you shine forth everywhere, / Rejoicing in the highest, / Looking down upon us who come to your temple / And cry out unceasingly: / Preserve us all, entreating God who loves mankind! The Master has given you to Naples, O holy one, / As a precious treasure and fountain of healings. / You are a guardian and protector of the faithful, / And you avert the evils of Vesuvius’ fire. / Therefore we cry to you in faith: / Rejoice, O Januarius, / Our father and protector!